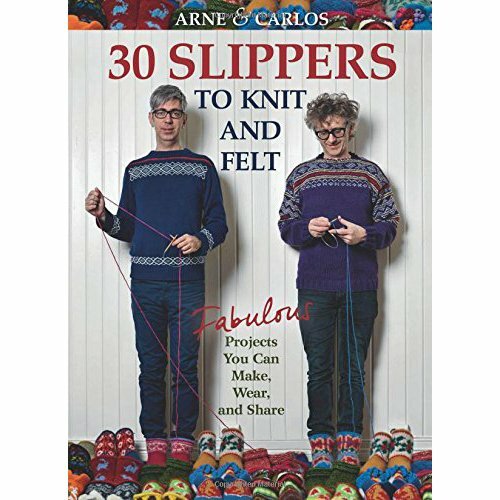 Arne & Carlos-30 Slippers to Knit-and-Felt is full of great ideas you're sure to fall in love with. The patterns are practical, playful, trendy, and even a bit silly. After a long day at work or even a long day traveling, there is nothing that says "home" more than a soft, warm pair slippers to slip on your feet. This fun collection of 30 designs will satisfy the slipper styles of everyone in the family, young or old, male or female. In addition to knitting instructions, techniques are covered with step-by-step color photos including felting, sizing, making pompoms, and more.